The Berlin Gardens Garden Classic Oblong Poly 44" x 64" Counter Height Table is the perfect showcase piece for your outdoor furniture area. With over five feet in length, this table provides plenty of room for your guests to eat, drink, and be happy. The Berlin Gardens Garden Classic Oblong Poly 44" x 64" Counter Height Table can fit with any outdoor decor, as we provide a number of different poly and cushion colors to choose from so you can create your own custom look. 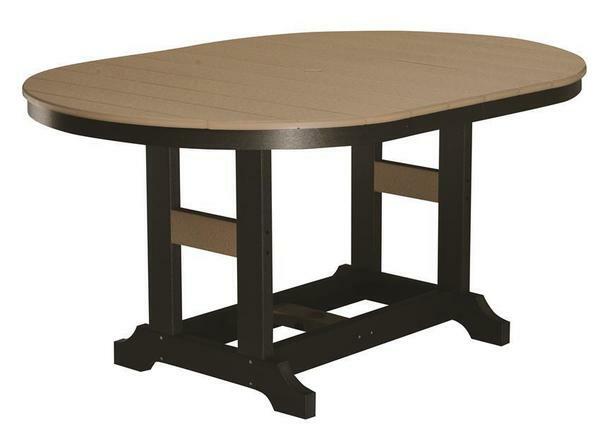 The table is handcrafted from eco-friendly poly lumber by Amish craftsmen in Ohio. Please call one of our Amish Furniture Specialists today to answer your questions and to start your order by phone. Toll-Free (866) 272-6773. Total Height - 35 ½"
Addition charges may apply - please call a Furniture Specialist for details.